Persistent symptoms of depression suggest the involvement of stable molecular adaptations in brain, which may be reflected at the level of chromatin remodeling. 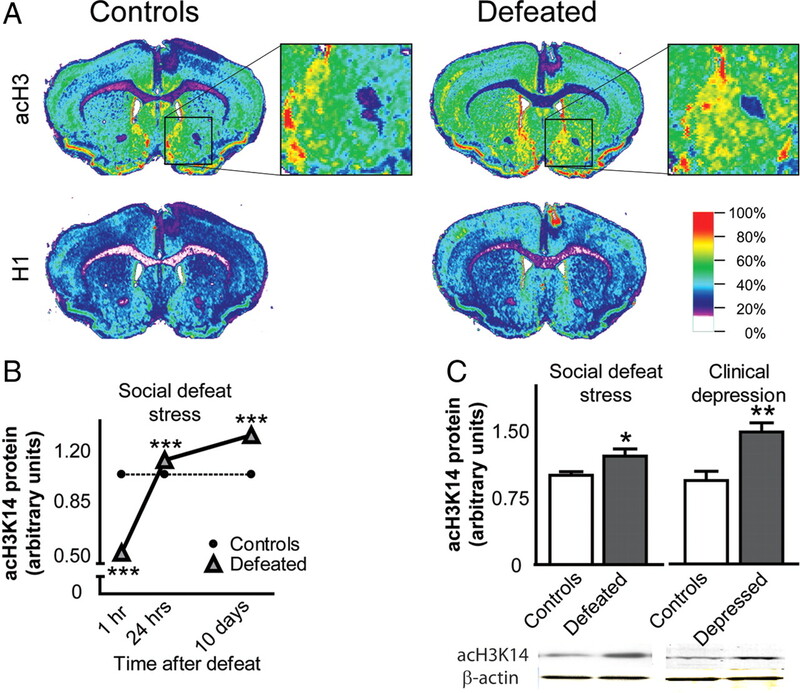 We find that chronic social defeat stress in mice causes a transient decrease, followed by a persistent increase, in levels of acetylated histone H3 in the nucleus accumbens, an important limbic brain region. This persistent increase in H3 acetylation is associated with decreased levels of histone deacetylase 2 (HDAC2) in the nucleus accumbens. Similar effects were observed in the nucleus accumbens of depressed humans studied postmortem. These changes in H3 acetylation and HDAC2 expression mediate long-lasting positive neuronal adaptations, since infusion of HDAC inhibitors into the nucleus accumbens, which increases histone acetylation, exerts robust antidepressant-like effects in the social defeat paradigm and other behavioral assays. HDAC inhibitor [N-(2-aminophenyl)-4-[N-(pyridine-3-ylmethoxy-carbonyl)aminomethyl]benzamide (MS-275)] infusion also reverses the effects of chronic defeat stress on global patterns of gene expression in the nucleus accumbens, as determined by microarray analysis, with striking similarities to the effects of the standard antidepressant fluoxetine. Stress-regulated genes whose expression is normalized selectively by MS-275 may provide promising targets for the future development of novel antidepressant treatments. Together, these findings provide new insight into the underlying molecular mechanisms of depression and antidepressant action, and support the antidepressant potential of HDAC inhibitors and perhaps other agents that act at the level of chromatin structure. Currently available antidepressants exert initial and rapid effects on monoaminergic systems in brain, whereas the mood-elevating effects of these agents require several weeks of administration. These observations have suggested the involvement of altered gene expression in antidepressant action. In recent years, a role for chromatin remodeling in antidepressant action has also been proposed: chronic exposure to antidepressant drugs alters histone acetylation and methylation in specific brain regions (Lee et al., 2006; Tsankova et al., 2006). Likewise, given the broad range of symptoms and multiple brain regions involved in depression, it has been postulated that transcriptional regulation of large gene sets may be altered by the disorder (Drevets, 2001; Charney and Manji, 2004; Krishnan and Nestler, 2008). Histone acetylation at lysine residues [e.g., acetylated histone H3 at lysine 14 (acH3K14)] is controlled by the actions of histone acetyltransferases (HATs) and histone deacetylases (HDACs) (Shahbazian and Grunstein, 2007; Tsankova et al., 2007). acH3K14 deacetylation serves to condense areas of chromatin, limiting access to transcriptional machinery at gene promoters (Kurdistani et al., 2004). In neuronal tissue, HDAC inhibitors prevent histone deactylation through the selective inactivation of class I or II HDACs, resulting in increased levels of histone acetylation. Two previous studies (Tsankova et al., 2006; Schroeder et al., 2007) reported modest antidepressant-like effects of sodium butyrate, a weak and highly nonspecific inhibitor of class I and class II HDACs, when given systemically. Whether the HDAC inhibitory effect of sodium butyrate is responsible for these antidepressant-like effects remains unknown. Investigations into the brain regions and target genes that mediate the antidepressant-like actions of HDAC inhibition could provide novel insight into the molecular mechanisms controlling depressive-like symptoms. The nucleus accumbens (NAc) has been implicated in the development of depressive-like behaviors and in antidepressant action (Willner, 1983; Zacharko and Anisman, 1991; Willner et al., 1992; Drevets, 2001; Charney and Manji, 2004; Nestler and Carlezon, 2006). The current experiments used the chronic social defeat model (Berton et al., 2006; Krishnan et al., 2007) to explore the impact of chronic stress on histone acetylation in this brain region. We also examined the antidepressant potential, across behavioral and genomic assays, of two HDAC inhibitors administered directly into the NAc: suberoylanilide hydroxamic acid (SAHA) (i.e., Vorinostat), a selective inhibitor of class I and II HDACs, and N-(2-aminophenyl)-4-[N-(pyridine-3-ylmethoxy-carbonyl)aminomethyl]benzamide (MS-275), a selective inhibitor of class I enzymes. Our results demonstrate that global levels of histone acetylation and of one particular HDAC enzyme, HDAC2, a class I HDAC, are regulated in the NAc by chronic social defeat stress in mice as well as in depressed humans examined postmortem. Moreover, we show that infusion of HDAC inhibitors into the NAc exerts potent antidepressant-like effects in several behavioral assays and at the level of gene expression. These studies provide direct support for the hypothesis that regulation of histone acetylation, specifically within the NAc, is part of an individual's adaptation to chronic stress and that targeting HDACs with selective inhibitors may provide a novel approach for treating depression. Nine- to 11-week-old C57BL/6J male mice (The Jackson Laboratory) were used in all experiments. Four days before the beginning of experiments, all mice were singly housed and maintained on a 12 h light/dark cycle with ad libitum access to food and water. Behavioral assessments and tissue collection were performed 1 h into the animals' dark phase. Mouse procedures were performed in accordance with the Institutional Animal Care and Use guidelines of University of Texas Southwestern and Mount Sinai School of Medicine. Social defeat stress was performed as described previously (Berton et al., 2006; Tsankova et al., 2006; Krishnan et al., 2007). Briefly, experimental C57BL/6J mice were exposed to a novel CD1 aggressor for 5 min daily over 10 consecutive days. Each CD1 mouse was a retired breeder (Charles River Laboratories) and <5 months of age (∼11–20 weeks of age). During bouts of physical contact, experimental C57BL/6J mice displayed visible signs of subordination including hallmark stress responses such as social escape, submissive posturing, and freezing. After 5 min of physical contact, experimental mice were removed from contact with the aggressor and placed on the opposite side of the aggressor's home cage behind a “protective” partition that was perforated with holes to allow for sensory contact during the following 24 h. Nondefeated control mice were housed as two animals per cage under the same conditions as their experimental counterparts but without the presence of an aggressive CD1 mouse. Experimental mice were relocated to a new cage each day immediately before the commencement of social defeat. Twenty-four hours after the final social defeat, all mice were housed individually. One hour, 24 h, or 10 d after chronic social defeat stress, mice (n = 6/group) were anesthetized and perfused intracardially with 4% paraformaldehyde in 1× PBS. Brains were removed and postfixed by immersion overnight in 4% paraformaldehyde and cryoprotected in 30% sucrose in 1× PBS. Coronal sections (35 μm) were cut on a freezing microtome and processed for infrared immunohistochemistry using a LI-COR system as described previously (Hawes and Picciotto, 2004). Briefly, brain sections including the NAc were preincubated in a blocking buffer containing 0.1% Triton and 3% normal donkey serum. A mixture of antibodies raised against acetyl-histone H3 Lys14 (Millipore) and histone H1 (Millipore) at respective dilutions of 1:30,000 and 1:20,000 were used overnight at 4°C in blocking buffer. After washing, sections were incubated with IRDye 680 donkey anti-mouse antibody and IRDye 800 donkey anti-rabbit (both diluted to 1:5000; LI-COR Biosciences) in PBS with 0.05% Triton for 2 h at room temperature. Fluorescent immunocomplexes were then detected using a LI-COR Odyssey Infrared Imager (21 μm resolution, 1 mm offset at the highest quality). Integrated intensities of acetylated H3 and total H1 were determined using the Odyssey software. Results are given as integrated intensity values per square millimeter. Values for H1 were used as a normalization control. To validate the quantification of acH3K14 using this method, a dot blot assay was performed using an acH3K14 peptide (Millipore). We confirmed a linear increase in the relative intensity of the LI-COR signal with increasing concentrations of peptide. In addition, the H1 protein was verified as a useful loading control as no differences in this protein were detectable when compared between defeated and control mice. The dot blot analysis and H1 protein data are shown in supplemental material S4, B and C (available at www.jneurosci.org as supplemental material). Bilateral NAc punches (15 gauge) were dissected from C57BL/6J mice as previously described (Renthal et al., 2007), 24 h after either 10 d of chronic social defeat stress or 10 d of control handling. Frozen brain tissue was later thawed in Trizol (Invitrogen) and processed according to the manufacturer's protocol. RNA was further purified using RNAeasy Micro columns (QIAGEN) and processed as indicated via the manufacturer's instructions. Spectroscopy confirmed that the RNA had 260/280 and 260/230 ratios >1.8. Total RNA was reverse transcribed using Superscript III (Invitrogen) and random hexamers following the instructions provided by the manufacturer. Quantitative PCR was performed using ∼25 ng of cDNA for each reaction plus primers and SYBR Green (ABI). Reactions were performed in triplicate, and quantified using the ΔΔCt method described previously (Tsankova et al., 2006). A list of primers used is included in supplemental material S1 (available at www.jneurosci.org as supplemental material). Frozen tissue punches from mouse (n = 6–8/group) or pulverized samples dissected from human (n = 8/group) NAc were assessed for protein analyses. For Western blotting, protein samples were subjected to boiling SDS extraction (1%) for 5 min, and protein quantification was subsequently performed using a DC protein assay (Bio-Rad). Thirty micrograms of total cell lysates were used to assess acH3K14 (Millipore; 1:1000) and HDAC2 (Santa Cruz Biotechnology; 1:500) levels via a standard Western blotting protocol (4–20% SDS-PAGE). β-Actin (MP Biomedicals; 1:40,000) was used to normalize acH3K14 bands to ensure for proper gel loading. Western blots were further quantified using standard densitometric analysis (NIH ImageJ software). Human specimens were obtained from the Dallas Brain Collection (Stan et al., 2006). With next of kin permission, tissue samples were collected from cases examined by the Dallas County Medical Examiner's Office and the Transplant Service Center at University of Texas Southwestern. Blood toxicology screens were conducted in each case, and subjects with a recent or past history of drug abuse, neurological disorders, or head injury were excluded. None of the cases used sustained agonal factors at the time of death (for details, see supplemental material S2, available at www.jneurosci.org as supplemental material). Clinical records and collateral information from telephone interviews with a primary caregiver were obtained for each case. Two psychiatrists performed extensive reviews of the clinical records and made independent diagnoses followed by a consensus diagnosis using Diagnostic and Statistical Manual of Mental Disorders, Fourth Edition, criteria. Specimens of human NAc were obtained, and RNA extracted, exactly as described previously (Krishnan et al., 2007). The RNA integrity of each sample was determined by isolating total RNA using Trizol (Invitrogen) followed by analysis with an Agilent 2100 Bioanalyzer. While under a combination of ketamine (100 mg/kg) and xylazine (10 mg/kg) anesthesia, mice were surgically implanted with two subcutaneous Alzet minipumps (model 1002; Durect) and bilateral guide cannulae (Plastics One) targeting the NAc. One day before surgery, two cannulae (28 gauge stainless steel) were filled with MS-275 (100 or 10 μm; provided by the Broad Institute), SAHA (100 μm; provided by the Broad Institute), or 5% hydroxypropyl β-cyclodextrin vehicle (Trappsol; CTD), and each pedestal within the assembly was separately affixed via vinyl tubing to a minipump, each loaded with drug or vehicle. The minipumps were activated on the evening before surgery (by incubating them at 40°C) to initiate a continuous delivery at 0.25 μl/h over 14 d. Briefly, the surgical procedure began with an incision over the skull, and the skin was spread apart under the scapulae to create an area for positioning the minipumps on the back. Bilateral cannulae were delivered into the NAc according to bregma: anteroposterior, +1.5; mediolateral, +1.0; dorsoventral, −4.5. Cannulae were permanently fixed to the skull with Loctite skull adhesive (Henkel). Cannulae, tubing, and minipumps were all secured under the skin using Vetbond tissue adhesive (3M) and two staples. Mice were allowed to recover from surgery for at least 5 d before beginning behavioral tests, or 9 d before molecular assessments. Five days after surgically implanting minipumps and cannula in defeated and control mice (n = 10–12/condition), behavioral assessments were examined in the following order under red lighting conditions. Social interaction was performed as previously described (Berton et al., 2006). Briefly, mice were placed into a novel arena with a small animal cage at one end. Their movement was monitored for 2.5 min in the absence of an aggressive CD1 mouse (used to determine open field behavior), followed by 2.5 min in the presence of the caged aggressor. We obtained information pertaining to the distance traveled (in centimeters), duration spent in the interaction zone (in seconds), as well as other measures using Ethovision 3.0 software. For sucrose preference testing, 50 ml tubes containing stoppers fitted with ballpoint sipper tubes (Ancare) were filled with solutions containing either 1% sucrose diluted in drinking water, or drinking water alone. All animals were acclimatized for 2 consecutive days to two-bottle choice conditions before 2 additional days of choice testing. On test days, fluid levels were noted, and the position of the tubes were interchanged. Sucrose preference was calculated as a percentage of sucrose/water consumed and was averaged over the 2 d of testing. As described previously (Krishnan et al., 2007), the forced-swim test was performed in a 4 L beaker containing ∼3 L of tap water at a temperature of 25 ± 1°C. Videotracking-based methods were used to record the duration of time spent “immobile” in the arena over a 6 min trial. The light/dark transition test was conducted in a two sided chamber divided by a small door in the center (20 × 40 × 20 cm). One side of the chamber was brightly lighted (∼300 lux) and the other chamber was protected from light (<5 lux). At the start of each test session, mice were gently placed into the dark compartment, and the door to the lighted compartment was opened 2 min later. Movement of the mouse into the lighted side is detected by photocells. Mice can move freely between the lighted and dark sides of the chamber for an additional 10 min. The total time spent in the lighted side of the chamber was calculated as the dependent measure. Custom-made pellets (Innovative Research) were used to deliver fluoxetine (20 mg · kg−1 · d−1; provided by Eli Lilly) continuously, for up to 20 d. The day after the last social defeat stress episode, mice were implanted subcutaneously with one fluoxetine (or placebo) pellet while under brief isoflurane anesthesia. Twenty days after implantation of the fluoxetine pellet, this procedure was found to result in blood levels of fluoxetine plus norfluoxetine (mean, 180 ng/ml) that are in the clinical range (150–250 ng/ml) (Brunswick et al., 2002). Eight groups of mice with four biological replicates per group were used for the microarray study (totaling 32 microarrays; results from two arrays were discarded because they did not meet quality control standards). Four separate groups of mice received direct intra-NAc delivery of MS-275 or vehicle, whereas an additional four groups received placebo or fluoxetine pellets. One-half of each cohort for the two drug treatments included nondefeated control mice, and one-half had previously undergone chronic (10 d) social defeat. Ten days after the start of intra-NAc infusion of HDAC inhibitor or fluoxetine pellets implantation, animals were rapidly decapitated and brains were removed and placed on ice. Dissections of NAc were taken using a 15 gauge needle punch and quickly frozen on dry ice until RNA was extracted. Bilateral punches were pooled from four animals per replicate, totaling 16 mice per group. RNA isolation, microarray processing, and data analysis were performed as previously described (Krishnan et al., 2007). Briefly, RNA was isolated using Trizol reagent (Invitrogen), was further purified with the RNAeasy micro kit from QIAGEN, and was checked for quality using Agilent's Bioanalyzer. Reverse transcription, amplification, labeling, and hybridization to Illumina MouseWG-8 V2.0 arrays were performed using standard procedures by University of Texas Southwestern's microarray core. Raw data were background subtracted and quantile normalized using Beadstudio software (Illumina). Normalized data were then analyzed using GeneSpring software (Agilent), and gene lists were generated using significance criteria of 1.3-fold change cutoff coupled with a nonstringent p value cutoff of p < 0.05. We have a high degree of confidence in these data for several reasons. First, all animals were handled, treated, and killed at the same time, under the same conditions. As well, all RNA and array processing was performed at the same time. Second, we performed quadruplicate arrays, with tissue pooled from multiple animals analyzed for each array sample, thereby minimizing differences attributable to individual variability and increasing statistical power (Peng et al., 2003). Third, the data analysis criteria used for our study are recommended by the MicroArray Quality Control (MAQC) project because these criteria have been validated to have the highest intersite reproducibility and intraplatform reproducibility (Guo et al., 2006; Shi et al., 2006). For assessing acetylated H3 in tissue slices after social defeat, ratios of acetylated H3 over total H1 were calculated, and a 2 × 3 ANOVA (stress by time) was used. mRNA levels of class I HDACS after social defeat were analyzed using an ANOVA. The relative density of acetylated H3 in the NAc after 10 d of in vivo infusion of vehicle, or the HDAC inhibitors MS-275 or SAHA were analyzed using an ANOVA. Western blot analyses of HDAC2 and acetylated H3 in the NAc of postmortem human tissue (depressed vs control) and in mice (defeated vs control) were compared using two-tailed t tests. For analyzing each depressive-like behavior, groups of nondefeated controls and socially defeated mice were compared using a 2 × 3 ANOVA (stress by drug). An additional group of defeated mice was included for examining a lower molar concentration of MS-275 infusion on depressive-like behaviors, but this group of mice was not included in the statistical analysis. For comparing MS-275 to vehicle treatments in light/dark box behavior, two-tailed t tests were used. For all one-way ANOVAs, post hoc tests were performed using Dunnett's multiple-comparisons test to selectively assess significant changes from the control condition. For all two-way ANOVAs, Bonferroni's post hoc tests were used to assess isolated comparisons. All differences were considered significant when p values were <0.05. Statistical analyses were performed with GraphPad Prism software. The NAc, which plays an important role in the expression of reward- and stress-related behavioral responses (Anisman and Zacharko, 1986; Wise, 1987; Koob, 1996), has been implicated more recently in depression (Nestler and Carlezon, 2006). Changes in histone acetylation within the NAc after chronic social stress may contribute to significant changes in gene expression that either sustain or oppose depressive-like behaviors (Berton and Nestler, 2006; Krishnan and Nestler, 2008). To directly assess this possibility, brains were collected from stressed and control mice at either 1 h, 24 h, or 10 d after chronic (10 d) social defeat stress (Berton et al., 2006). Using immunohistochemical analysis, levels of acH3K14 were quantified in the NAc. Shown in Figure 1A are representative sections at the level of the NAc obtained in chronically defeated or nondefeated control mice stained for acH3K14 (top) or total histone H1 (bottom). We selected the Lys14 residue for analysis since it is tightly associated with increases in gene transcription (Shahbazian and Grunstein, 2007). We found that levels of acH3K14 are dynamically regulated after chronic social defeat stress: acH3K14 levels are decreased ∼50% 1 h after the final stress event but are significantly increased at both 24 h and 10 d after social defeat stress (Fig. 1B), as indicated by a main effect of stress (F(1,30) = 51.3; p < 0.0001), a main effect of time (F(2,30) = 946.4; p < 0.0001), and a significant interaction (F(2,30) = 946.4; p < 0.0001). A significant increase in acH3K14 levels in the NAc was also verified by Western blotting, using tissue collected 15 d after the last social defeat episode (t(7) = 2.4; p = 0.047) (Fig. 1C, left). Chronic social defeat stress in mice and clinical depression are associated with increased levels of acetylated H3 in the NAc. A, Brain sections were collected from C57BL/6J mice at 1 h, 24 h, or 10 d after chronic (10 d) social defeat or control conditions. acH3K14, and total levels of histone H1 as a control, were then quantified using immunohistochemical analysis in the NAc (indicated by the square). Shown here is a representative section collected 10 d after the last social defeat stress or control condition. B, Acetylated H3 is dynamically regulated after chronic defeat stress: acH3K14 (normalized to total H1) is decreased 1 h after the final stress episode but significantly increased 24 h and 10 d later compared with nondefeated controls. Differences between nonstressed controls and chronically defeated mice at each time point are denoted by triple asterisks (***) to indicate significance at p < 0.001. C, Increased levels of acH3K14 in the NAc 15 d after chronic social defeat stress are also evident by Western blot (left) Similarly, clinical depression is accompanied by an increase in levels of acH3K14 in the NAc compared with matched controls (right) (*p < 0.05, **p < 0.01). Error bars indicate SEM. To study the relevance of these altered levels of acH3K14 induced in the NAc of mice subjected to chronic social defeat stress to human depression, we examined acH3K14 levels in human postmortem NAc tissue obtained from depressed and extensively matched control individuals. Equivalent to the persistent increase in acH3K14 found in mouse NAc after chronic defeat stress, we found that human depression is associated with a significant increase (t(14) = 3.7; p = 0.001) in levels of acH3K14 in the NAc (Fig. 1C, right). This analysis included subjects who were and were not on antidepressants at their time of death. However, chronic administration of fluoxetine had no impact on levels of acH3K14 in the mouse NAc (t(10) = 1.3; p = 0.2) (data not shown), arguing against a drug effect in our depressed human sample. acH3K14 has been shown to be regulated by class I HDACs (Rundlett et al., 1996). Accordingly, we next examined whether levels of expression of class I HDACs, namely, HDAC1, HDAC2, or HDAC3, are altered in the NAc after chronic social defeat stress in mice. HDAC2, but not HDAC1 or HDAC3, mRNA levels were significantly decreased (F(2,21) = 27.8; p < 0.0001) 24 h after chronic defeat stress (Fig. 2A), an adaptation that could mediate the observed increase in acH3K14 levels at this time point. This effect of chronic social defeat on HDAC2 expression is a long-lasting phenomenon, as protein levels of the enzyme are significantly reduced (t(8) = 2.5; p = 0.04) for up to 15 d after the last defeat episode (Fig. 2B, left). 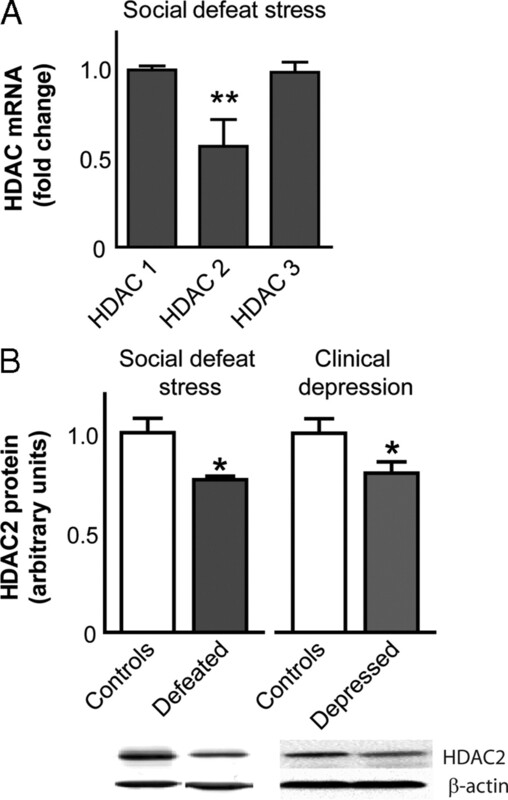 Chronic social defeat stress in mice and clinical depression are associated with decreased levels of HDAC2 in the NAc. A, Chronic (10 d) social defeat stress decreases mRNA levels of HDAC2, but not of HDAC1 or HDAC3, in the NAc relative to nondefeated controls examined 24 h after the last defeat episode (**p < 0.01). B, Likewise, HDAC2 protein levels are significantly decreased 15 d after the last social defeat episode (left) and also downregulated in human postmortem NAc collected from a clinically depressed population compared with matched controls (right) (*p < 0.05). Error bars indicate SEM. Since human depression, like mouse social defeat, is associated with increased acH3K14 levels in the NAc, we hypothesized that HDAC2 could be similarly reduced in this region of clinically depressed individuals. Using the same postmortem tissue examined in Figure 1B, HDAC2 protein expression was found to be downregulated (t(14) = 2.2; p = 0.02) in the NAc of depressed humans (Fig. 2B, right), further corroborating that the effects observed after social defeat stress in mice are clinically relevant. In mouse, chronic treatment with fluoxetine did not significantly alter levels of HDAC2 protein in the NAc (t(10) = 1.9; p = 0.1) (data not shown), further suggesting that antidepressant treatment in our human sample did not affect HDAC2 expression. To test the functional role played by altered levels of acH3K14 in the NAc, groups of mice subjected to chronic (10 d) social defeat stress and nonstressed control mice were, on day 11, surgically prepared with Alzet subcutaneous minipumps connected to bilateral guide cannulae allowing for continuous infusion of HDAC inhibitors or vehicle into the NAc over extended periods of time. After 5 d of infusion, each mouse was tested for its time spent interacting with a novel mouse under controlled conditions. A reduction in social interaction is one of the most robust and lasting sequelae of chronic social defeat stress and can be reversed by chronic (not acute) treatment with antidepressants (Berton et al., 2006; Tsankova et al., 2006). We observed a significant effect of social defeat (F(1,54) = 20.5; p < 0.0001) and a significant effect of HDAC inhibitor (F(2,54) = 9.7; p = 0.0002) on this measure of social interaction when infused into the NAc. As reported previously for unoperated animals, we found that chronically stressed mice, which received intra-NAc vehicle infusions over 5 d, spent significantly less time engaged in social interaction compared with that of controls (Fig. 3A). 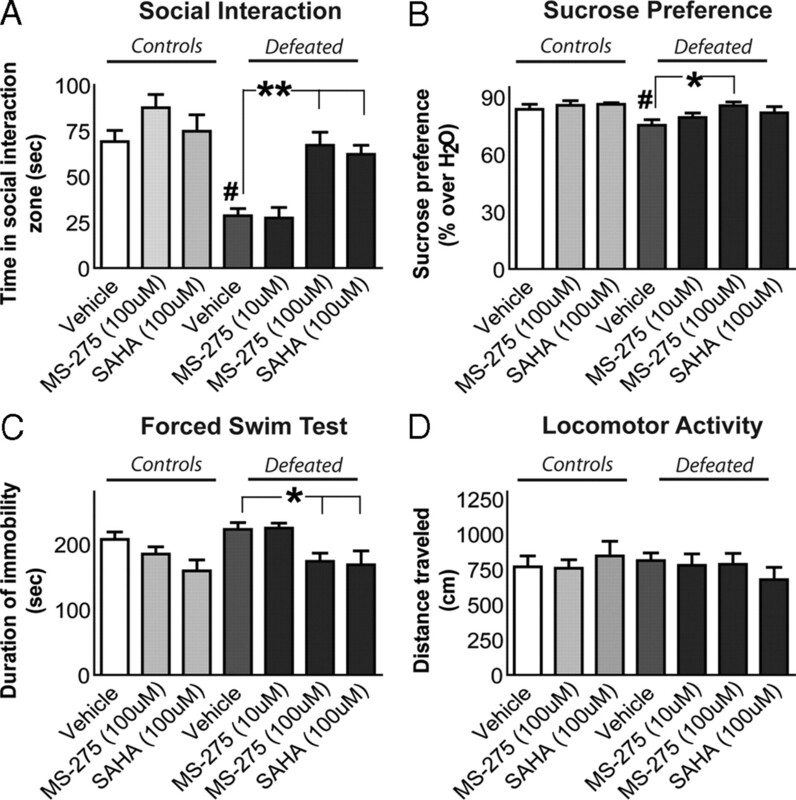 In contrast, continuous infusion of either MS-275 (100 μm) or SAHA (100 μm) into the NAc reversed the stress-induced social avoidance in defeated mice and restored the amount of time the animals spent interacting socially (Fig. 3A). HDAC inhibitors have robust antidepressant-like effects when infused into the NAc. After chronic (10 d) social defeat stress or control conditions, separate groups of mice were fitted with subcutaneous minipumps and bilateral guide cannulae to receive a continuous infusion of the HDAC inhibitor MS-275 or SAHA, or vehicle, into the NAc. A, On experimental day 15 (5 d after surgery), each mouse was examined for total time spent within the “interaction zone” when a social target was present. When receiving vehicle infusion, stressed mice spent significantly less time engaged in social interaction when compared with nondefeated controls. In contrast, the infusion of either MS-275 (100 μm) or SAHA (100 μm) restored the amount of time spent interacting socially. B, Over the next 4 d, preference for a sweetened 1% sucrose solution (over water alone) was examined across these same groups. Defeated mice infused with vehicle had a reduced preference for sucrose compared with their controls, and this effect of stress was reversed by the MS-275 (100 μm) infusion. C, On the next day, a forced-swim test was conducted. Chronic stress increased the total duration of immobility recorded within vehicle-treated mice. MS-275 (100 μm) and SAHA (100 μm) both decreased the duration of stress-induced immobility during this test. D, During 2.5 min of exposure to an open field, no differences in distance traveled were observed across the various treatment groups. Differences between vehicle and drug infusions in socially defeated mice are denoted by an asterisk (*) and double asterisks (**) to indicate significance at p < 0.05 or 0.01, respectively. Differences between vehicle-treated nondefeated controls and socially defeated groups are denoted by a pound sign (#) to indicate significance at p < 0.05. Error bars indicate SEM. Over the next 4 d, mice were examined for their preference for a sucrose solution over water alone. We observed a significant effect of social defeat (F(1,54) = 4.6; p < 0.04) and a significant effect of HDAC inhibitor (F(2,54) = 3.4; p = 0.04) on sucrose preference when infused into the NAc. Defeated mice chronically infused with vehicle displayed a significantly reduced preference for sucrose solution compared with nondefeated vehicle controls, as reported previously for unoperated animals (Krishnan et al., 2007), and this effect of chronic stress was also reversed by infusion of MS-275 (100 μm) (Fig. 3B). Subsequent to the sucrose preference test, the forced-swim task was conducted. A significant effect of HDAC inhibitor infused into the NAc was found on the duration of immobility (F(2,54) = 5.8; p = 0.005). Specifically, time spent swimming was increased by infusion of either MS-275 (100 μm) or SAHA (100 μm) into the NAc in previously defeated and control mice (Fig. 3C). Such an increase in swimming represents an antidepressant-like effect in the forced-swim test. We observed a slight (and insignificant) reduction in the duration of time spent swimming after chronic stress. During a 3 min exposure to an open field, no differences were found between any groups of mice with regard to the total amount of locomotor activity recorded (Fig. 3D), an important control for the forced-swim and other behavioral measures. To complement these behavioral studies on depressive-like behavior, we also compared the effects of continuously infusing MS-275 (100 μm) into the NAc on the expression of anxiety-like behavior as measured during a light/dark test (Bourin and Hascoët, 2003). After 7 d of infusion with either MS-275 or vehicle, mice were placed into the dark compartment of the light/dark box, and the amount of time spent in the light compartment was assessed. MS-275 had no effect on anxiety-like behavior when infused into the NAc (data not shown). To confirm that HDAC inhibitors are reliably delivered into the NAc via osmotic minipump infusion, and to validate that these drugs are biochemically active at the site of infusion, levels of acH3K14 were quantified under the infusion site after 10 continuous days of treatment. Immunohistochemistry and Western blotting (F(2,10) = 9.9; p = 0.004) confirmed that acH3K14 levels are robustly elevated in the NAc of mice that received continuous infusion of MS-275 (100 μm) or SAHA (100 μm) compared with vehicle-treated controls (Fig. 4A,B). Continuous infusion of MS-275 (100 μm) or SAHA (100 μm) into the NAc significantly increases acetylated H3 in vivo. acH3K14 was quantified directly where the HDAC inhibitor was delivered after 10 continuous days of treatment via immunohistochemistry (A) and Western blotting (B) (*p < 0.01, SAHA; **p < 0.001, MS-275). Error bars indicate SEM. One consequence of chronic social defeat stress is the promulgation of a distinctive pattern of gene expression in the NAc, which can be mostly normalized to that of nonstressed control mice by chronic fluoxetine treatment (Berton et al., 2006). Given that MS-275, when infused directly into the NAc, promotes an antidepressant-like behavioral profile similar to that of chronic, systemic fluoxetine administration, we tested whether the two treatments also exert a similar regulatory impact on gene expression in the NAc. To directly compare the effect of MS-275 treatment to that of the conventional antidepressant fluoxetine on patterns of gene expression in the NAc, both drugs were administered continuously for 10 d (MS-275 via intra-NAc infusion and fluoxetine via systemic pellet implantations) after chronic (10 d) social defeat stress, and gene expression patterns in the NAc were studied using microarray technology. We confirmed that this 10 d course of treatment with MS-275 or with fluoxetine induced equivalent antidepressant-like effects in the social interaction test (data not shown). We found that social defeat stress, as observed previously, induces a unique pattern of gene expression in the NAc and that this global pattern of gene transcription is mostly reversed by treatment with either MS-275 or fluoxetine (Fig. 5A). In addition to genes affected similarly by MS-275 and fluoxetine, each treatment also uniquely reversed smaller, distinct subsets of defeat-regulated genes in the NAc. Overall, MS-275 altered expression of a larger number of genes than fluoxetine, and regulated approximately the same number of genes in chronically stressed and control animals (Fig. 5B). Close to one-third of all regulated genes showed similar regulation by MS-275 in stressed versus control mice. In contrast, fluoxetine altered expression of more than twofold more genes in chronically stressed mice than in control mice, with <10% overlap between the two conditions. These data are consistent with reports that fluoxetine causes little to no mood-elevating effect in humans in the absence of depression or a related syndrome (Tsankova et al., 2006). Gene expression arrays provide novel insight into the molecular mechanisms of antidepressant action in the NAc. Extending previous reports, chronic (10 d) social defeat stress induces a unique pattern of gene expression in the NAc that is mostly reversed by fluoxetine or MS-275 administration. Vehicle or MS-275 (100 μm infusion into the NAc), or placebo or fluoxetine (20 mg · kg−1 · d−1, subcutaneous pellet) were administered for 10 continuous days after chronic (10 d) social defeat stress or control conditions, and representative patterns of gene expression in the NAc were analyzed using Illumina microarrays. 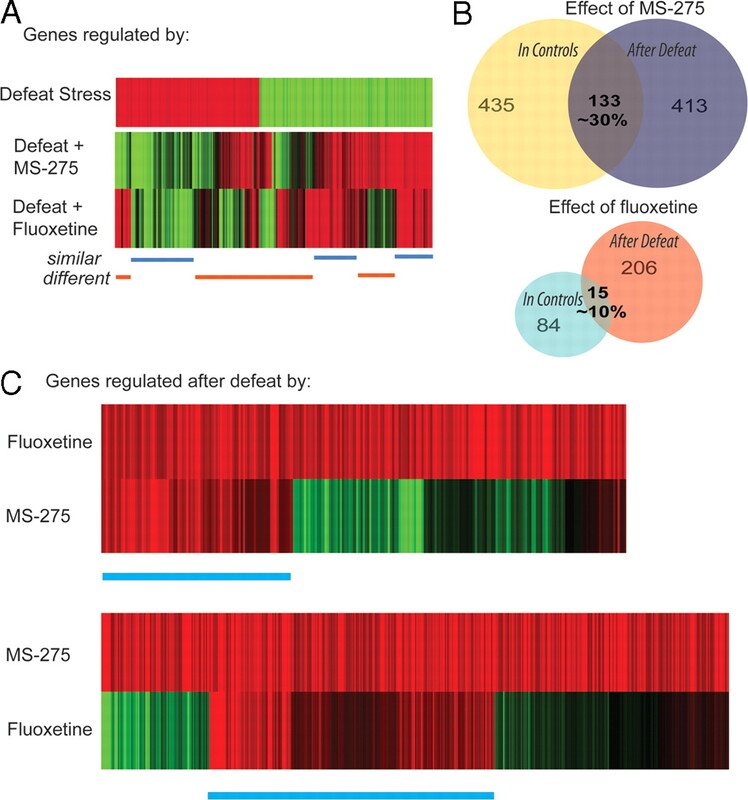 A, Chronic stress-induced genomic regulation is mostly reversed by MS-275 or fluoxetine, with differences between the two treatments indicated by the red bars and similarities indicated by blue bars. B, Within MS-275-treated mice, gene expression is robustly regulated in both nonstressed controls (∼435 genes) and defeated mice (∼413). In contrast, fluoxetine regulates a large number of genes in previously stressed mice only (∼206), with many fewer genes regulated in nonstressed controls (∼84). C, When analyzing only those genes that are upregulated by fluoxetine after chronic stress, MS-275 regulates many of them in a similar way (above the top blue bar), although some are differently regulated. In much the same way, fluoxetine similarly regulates a sizable percentage of the MS-275-regulated genes (above the bottom blue bar). We next compared in greater detail the effects of MS-275 and fluoxetine on gene expression in the NAc after chronic social defeat stress. Focusing on genes that are upregulated by fluoxetine in chronically stress mice, we identified a set of genes (∼37%) that are similarly upregulated by MS-275 (Fig. 5C, above the top blue bar). Other fluoxetine-regulated genes are either not affected by MS-275 (∼15%) or are regulated in the opposite direction by this HDAC inhibitor (48%). Conversely, a larger set of genes are upregulated by MS-275 after chronic social defeat, as mentioned previously, with fluoxetine causing similar regulation for 48% of the genes, no effect for 9%, and opposite effects to MS-275 for 43% (Fig. 5C, above the bottom blue bar). Examples of genes that exhibit these varying patterns of regulation are listed in Table 1(for full gene lists, see supplemental material S3, available at www.jneurosci.org as supplemental material). Fifteen genes regulated on the microarrays by MS-275 after chronic social stress were randomly selected for validation by quantitative PCR (qPCR) analysis. Of these, regulation of 12 genes (80%) was confirmed on independent tissue samples, indicating a relatively low false-positive rate consistent with previous microarray studies of microdissected brain tissue. Among the MS-275- and fluoxetine-regulated genes are several that would be expected to exert antidepressant-like effects based on information in the literature, as well as many novel genes that provide new insight into the molecular basis of defeat stress and its reversal by established antidepressants or HDAC inhibition (see Discussion). Portrayed in Figure 6 are examples of genes, and their molecular pathways, that were significantly regulated in the NAc by either social stress alone or the poststress treatment with MS-275. Many of the genes regulated by MS-275 after social defeat stress provide insight into potentially novel targets for reversing stress-induced depressive-like behavior. The identification of genes whose products regulate cellular morphology via effects on actin reorganization [e.g., SLIT, TGFα, p38, JNK (c-Jun N-terminal kinase), and Rho] is very interesting because of the emerging significance of dendritic restructuring in the persistence of depression (Krishnan and Nestler, 2008). 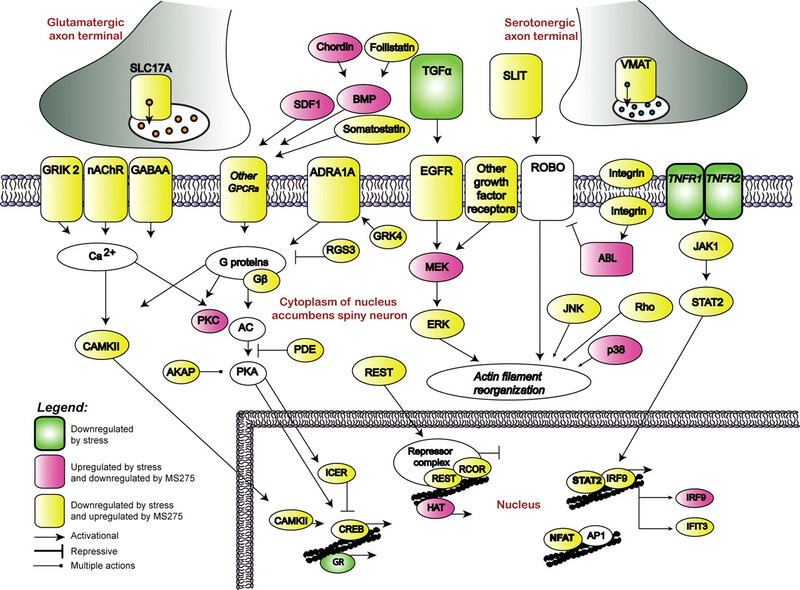 The complex impact of chronic stress and MS-275 treatment on intracellular signaling cascades is further evidenced by the regulation of numerous molecular pathways that control gene transcription. For instance, regulation of the transcription factors CREB (cAMP response element-binding protein), ICER (inducible cAMP early repressor), REST (RE1 silencing transcription factor), co-REST, STAT (signal transducer and activator of transcription), and NFAT (nuclear factor of activated T-cells) presumably contribute to stress- and MS-275-induced changes in histone acetylation at regulated genes. Molecular pathway analysis of genes regulated in the NAc by the HDAC inhibitor MS-275 after chronic social defeat stress. Examples of highly regulated molecular pathways include genes that encode presynaptic vesicular proteins, plasma membrane receptors, intracellular signaling molecules, proteins that regulate the actin cytoskeleton, and the transcriptional regulatory machinery. Histone acetylation is a promising target for novel treatments of psychiatric illness because of its control over patterns of gene transcription that ultimately establish and stabilize cognitive and behavioral processes. The current study reveals a robust antidepressant-like effect of HDAC inhibitors delivered directly into the NAc after chronic social defeat stress. Our results also demonstrate that chronic social stress induces a complex pattern of changes in H3 acetylation in the NAc, with a dramatic decrease observed 1 h after the last stress, followed by a smaller, but sustained increase in acetylated H3 that persists for at least 2 weeks. The observation that inhibition of HDACs and the consequent increase in H3 acetylation in the NAc induces robust antidepressant-like effects suggests that the transient reduction in H3 acetylation after social defeat stress may contribute to depressive symptoms, whereas the sustained increase in H3 acetylation represents a positive adaptation that serves to restore normal functioning. The mechanism underlying the transient decrease in H3 acetylation remains unknown, but the lasting increase in levels of acetylated H3 in the NAc could be mediated via a persistent and selective decrease in expression of the class I HDAC, HDAC2, in the NAc. The notion that downregulation of HDAC2 in the NAc may be an adaptive mechanism is interesting in light of recent findings that, in the hippocampus, HDAC2 is an important mediator of synaptic plasticity and morphological changes necessary for associative learning (Guan et al., 2009). This underscores the very different effects that HDAC2, like many other proteins (Nestler and Carlezon, 2006), play in distinct brain regions. Importantly, we show here that human depression, like chronic social defeat in mice, is also associated with increased levels of H3 acetylation and reduced levels of HDAC2 expression in the NAc. These findings further establish the validity of chronic social defeat as a bona fide model of depression (Kudryavtseva et al., 1991; Rygula et al., 2005; Berton et al., 2006; Krishnan et al., 2007; Miczek et al., 2008). Based on the antidepressant-like effects of HDAC inhibition in the mouse NAc, we hypothesize that reduced HDAC2 expression in the NAc is an adaptive neuronal response that emerges with clinical depression. We speculate that this adaptive response may, in some individuals, promote neuronal plasticity and contribute to recovery. The fact that chronic fluoxetine treatment does not increase H3 acetylation, or decrease HDAC2 levels, in the mouse NAc indicates that HDAC inhibition represents a distinct and fundamentally novel mechanism of antidepressant action that now warrants direct study in clinical populations. The NAc is important for processing reward-related stimuli (Wise, 1987; Koob, 1996; Carelli, 2002). Clinical depression often includes anhedonic, motivational, and arousal deficits, suggesting a role for the NAc in mediating these symptoms (Nestler and Carlezon, 2006). As such, we find that infusing HDAC inhibitors into the NAc reverses the effect of chronic defeat stress on social avoidance, decreased sucrose preference, and decreased mobility during the forced-swim task. The persistent increase in H3 acetylation in this brain area combined with the antidepressant-like effect of HDAC inhibitor infusion verifies the importance of the NAc in the emergence of stress-induced depressive symptoms and their reversal during effective treatment. To complement the behavioral studies, we compared global patterns of gene expression by microarray analysis in the NAc after local MS-275 infusion with that of systemic fluoxetine treatment in stressed and control mice. These gene arrays provide novel insight into potential molecular targets for the development of new treatments for depression, particularly symptoms that pertain to NAc function. Social defeat stress produces a distinct pattern of gene expression, in the NAc, which is generally reversed by treatment with either MS-275 or fluoxetine. For example, the neuropeptide cortistatin is downregulated by stress in the NAc, an effect reversed by both treatments. Cortistatin is normally regulated by circadian variables, and disruptions in this gene may be related to the severe disruptions in sleep and arousal among depressed individuals (Spier and de Lecea, 2000). In addition, stress-induced disruption of glutamatergic signaling, synaptic plasticity, inflammatory responses, and chromatin remodeling may serve to promote and sustain depressive-like behaviors: genes such as slc17a (glutamate transporter protein), abl1 (tyrosine kinase), nrn1 (neuritin), rab3b (Ras associated protein 3b), tnfrsf1a (tumor necrosis factor receptor superfamily, member 1A), and sin3b (transcriptional regulator), involved in these various molecular pathways, are each regulated by chronic stress and reversed by both drug treatments. Importantly, these genes may be part of a shared mechanism of antidepressant action for MS-275 and fluoxetine. In an attempt to reveal novel targets for antidepressant action, we examined genes whose regulation by chronic stress was reversed by MS-275, but not by fluoxetine. Examples of such genes include gja5 (involved in gap junction formation) and dlgap1 (assembles postsynaptic density complexes). A decrease in gap junctions after cocaine administration (Bennett et al., 1999) may indicate a possible mechanism for cross-sensitization between stress and stimulants. Insensitivity to the α-adrenergic receptor (encoded by the gene adra1a) has been implicated in depression (Cedarbaum and Aghajanian, 1976), and this gene was also downregulated by stress and restored by MS-275. Interestingly, the observation that many genes induced by chronic defeat stress were also restored by MS-275 indicates the complexity of transcriptional regulation in the brain (Sapolsky, 2003). Overall, these results define the complex patterns of gene regulation in the NAc during the emergence of depressive-like symptoms and their reversal by antidepressant treatments. Depression involves the persistent expression of diverse symptoms, suggesting the involvement of stable molecular adaptations in the NAc, a brain region important for processing emotional stimuli. Here, we report that chronic social stress leads to prolonged increases in levels of acetylated histone H3 in the NAc with a corresponding decrease in levels of HDAC2. The effects of social stress on acetylated H3 and HDAC2 in the current mouse model of depression were also observed in the NAc of postmortem depressed humans, which further validates the social defeat model and demonstrates the relevance of chromatin remodeling in human depression. Furthermore, HDAC inhibitor infusion into the NAc after chronic stress produces robust antidepressant-like effects across several behavioral assays. Presumably, the antidepressant-like effects of HDAC inhibition occur by increasing histone acetylation at certain gene promoters and thereby exerting complex effects on gene expression, as revealed here by gene arrays for MS-275. These effects overlap significantly with those of standard antidepressants but also reveal additional potential targets of HDAC inhibition. Together, these findings support the utility of HDAC inhibitors as antidepressants and provide novel insight regarding the molecular mechanisms underlying antidepressant responses. This work was supported by grants from the National Institute of Mental Health and a research alliance with AstraZeneca. E.J.N. reports consulting income from Merck Research Laboratories and PsychoGenics, Inc.
(1986) Behavioral and neurochemical consequences associated with stressors. Ann N Y Acad Sci 467:205–225. (2000) Uptake of glutamate into synaptic vesicles by an inorganic phosphate transporter. Science 289:957–960. (1999) Long-term changes in connexin32 gap junction protein and mRNA expression following cocaine self-administration in rats. Eur J Neurosci 11:3329–3338. (2006) New approaches to antidepressant drug discovery: beyond monoamines. Nat Rev Neurosci 7:137–151. (2003) The mouse light/dark box test. Eur J Pharmacol 463:55–65. (2002) Fluoxetine and norfluoxetine plasma concentrations during relapse-prevention treatment. J Affect Disord 68:243–249. (2002) The nucleus accumbens and reward: neurophysiological investigations in behaving animals. Behav Cogn Neurosci Rev 1:281–296. (1976) Noradrenergic neurons of the locus coeruleus: inhibition by epinephrine and activation by the alpha-antagonist piperoxane. Brain Res 112:413–419. (2002) TNF-R1 signaling: a beautiful pathway. Science 296:1634–1635. (2001) Differential involvement of NMDA, AMPA/kainate, and dopamine receptors in the nucleus accumbens core in the acquisition and performance of pavlovian approach behavior. J Neurosci 21:9471–9477. (2001) Neuroimaging and neuropathological studies of depression: implications for the cognitive-emotional features of mood disorders. Curr Opin Neurobiol 11:240–249. (1998) Differential activation of ErbB receptors in the rat olfactory mucosa by transforming growth factor-alpha and epidermal growth factor in vivo. J Neurobiol 37:199–210. (2001) Interneurons, spike timing, and perception. Neuron 32:771–774. (2003) KCNQ1 channels sense small changes in cell volume. J Physiol 549:419–427. (2009) HDAC2 negatively regulates memory formation and synaptic plasticity. Nature 459:55–60. (2006) Rat toxicogenomic study reveals analytical consistency across microarray platforms. Nat Biotechnol 24:1162–1169. (2004) Characterization of GalR1, GalR2, and GalR3 immunoreactivity in catecholaminergic nuclei of the mouse brain. J Comp Neurol 479:410–423. (2004) Abl tyrosine kinase promotes dendrogenesis by inducing actin cytoskeletal rearrangements in cooperation with Rho family small GTPases in hippocampal neurons. J Neurosci 24:8510–8521. (2005) Membrane recruitment of effector proteins by Arf and Rab GTPases. Curr Opin Struct Biol 15:681–689. (2008) The molecular neurobiology of depression. Nature 455:894–902. (1991) Social model of depression in mice of C57BL/6J strain. Pharmacol Biochem Behav 38:315–320. (2004) Mapping global histone acetylation patterns to gene expression. Cell 117:721–733. (2006) CoRest-like complexes regulate chromatin modification and neuronal gene expression. J Mol Neurosci 29:227–239. (2006) Histone H3 lysine 4 demethylation is a target of nonselective antidepressive medications. Chem Biol 13:563–567. (1997) Neuritin: a gene induced by neural activity and neurotrophins that promotes neuritogenesis. Proc Natl Acad Sci U S A 94:2648–2653. (2008) Membrane potential shifts caused by diffusible guidance signals direct growth-cone turning. Nat Neurosci 11:762–771. (2003) Statistical implications of pooling RNA samples for microarray experiments. BMC Bioinformatics 4:26. (2007) Histone deacetylase 5 epigenetically controls behavioral adaptations to chronic emotional stimuli. Neuron 56:517–529. (1996) HDA1 and RPD3 are members of distinct yeast histone deacetylase complexes that regulate silencing and transcription. Proc Natl Acad Sci U S A 93:14503–14508. (2005) Anhedonia and motivational deficits in rats: impact of chronic social stress. Behav Brain Res 162:127–134. (2003) Stress and plasticity in the limbic system. Neurochem Res 28:1735–1742. (2006) Rab3 superprimes synaptic vesicles for release: implications for short-term synaptic plasticity. J Neurosci 26:1239–1246. (2007) Antidepressant-like effects of the histone deacetylase inhibitor, sodium butyrate, in the mouse. Biol Psychiatry 62:55–64. (2007) Functions of site-specific histone acetylation and deacetylation. Annu Rev Biochem 76:75–100. (2006) The MicroArray Quality Control (MAQC) project shows inter- and intraplatform reproducibility of gene expression measurements. Nat Biotechnol 24:1151–1161. (2000) Cortistatin: a member of the somatostatin neuropeptide family with distinct physiological functions. Brain Res Brain Res Rev 33:228–241. (2006) Human postmortem tissue: what quality markers matter? Brain Res 1123:1–11. (1997) SAPAPs. A family of PSD-95/SAP90-associated proteins localized at postsynaptic density. J Biol Chem 272:11943–11951. (2000) Oxidative stress causes mucin synthesis via transactivation of epidermal growth factor receptor: role of neutrophils. J Immunol 164:1546–1552. (2006) Sustained hippocampal chromatin regulation in a mouse model of depression and antidepressant action. Nat Neurosci 9:519–525. (2006) Role of structural and dynamical plasticity in Sin3: the free PAH2 domain is a folded module in mSin3B. J Mol Biol 358:485–497. (1999) Biochemical purification of a mammalian slit protein as a positive regulator of sensory axon elongation and branching. Cell 96:771–784. (1981) Excitatory amino acid transmitters. Annu Rev Pharmacol Toxicol 21:165–204. (2002) Regulation of cortical dendrite development by Slit-Robo interactions. Neuron 33:47–61. (1983) Dopamine and depression: a review of recent evidence. II. Theoretical approaches. Brain Res 287:225–236. (1992) Chronic mild stress-induced anhedonia: a realistic animal model of depression. Neurosci Biobehav Rev 16:525–534. (1987) The role of reward pathways in the development of drug dependence. Pharmacol Ther 35:227–263. (1991) Stressor-induced anhedonia in the mesocorticolimbic system. Neurosci Biobehav Rev 15:391–405.